When plumbing issues arise, they can be very unpleasant. This is why it is very important to maintain a well-functioning plumbing system in your home. Having a steady flow of safe and clean water throughout the house is essential to completing daily household activities and tasks. In case you are in search of a reliable, and expert plumbing company to take care of all your residential and commercial plumbing needs, A-1 Plumbing Service is the perfect fit to get the job done. We all know how awful it is to wake up and have to struggle through taking a cold shower, and having access to a 24 hour Apopka plumbing service could be an easy solution in emergencies like these. This can turn into a really messed up situation. At the end of the day, your plans can be affected. This is not a good way to get the day started. Thankfully, Apopka and Orlando homeowners now have an expert plumbing company that is always available to ensure that their plumbing systems are functioning properly. Even if you are in need of Emergency Plumbing in Apopka, or you will like to hire the services of a company offering 24 Hour Apopka Plumbing, A-1 Plumbing Service is always available to help. A-1 Plumbing Service remains one of the most reliable Plumbers in Apopka FL. Some of the plumbing services we offer include re-piping, water heater service, and repair, drain cleaning and unclogging and lot more. We also offer Emergency Plumbing in Apopka. No matter when your plumbing issue arises, our 24 Hour Apopka Plumbing is always on ground to take care of the issue and provide the adequate solution as soon as we can. Furthermore, we offer a wide variety of services including emergency plumbing in Apopka and the surrounding areas. Our 24-hour emergency plumbing in Apopka will ensure that you are never in a compromising position. As the premier Apopka plumber, we will do what it takes to make sure that you receive the quality, personalized service that you expect. At A-1 Plumbing Service, our team of professional plumbers are always ready to restore your plumbing issues to its proper functioning state. Whether it is a busted pipe, damaged faucet, broken toilet, clogged drainage system, or you are having serious issues with your water heater, septic systems showers, and tubs, and you are in need of an emergency or quick-fix, A-1 Plumbing Service is always ready to take care of all your Emergency Plumbing in Apopka. Even if it is 24 Hour Apopka Plumbing, we are here for you without stopping for even a minute, all around the year. We have been serving Apopka, Florida, and surrounding environments since 1954. The experience we have as well as the way we deliver our plumbing services remains unparalleled. We offer all types of services including Re-piping, Water Heater Maintenance, and much more. The quality workmanship, customer service and attention to detail are what set A1 Plumbing Service apart from our competition. We aim to provide you with the easiest and most convenient experience when you require Apopka plumbing services. We will work around your schedule to ensure that we service your problem at the most convenient time possible. We do not believe in compromising on quality all in the name of saving cost. All materials used for your plumbing projects are high quality and industry standards. We give a warranty on all materials. You can rest assured that irrespective of what happens, we have everything covered. 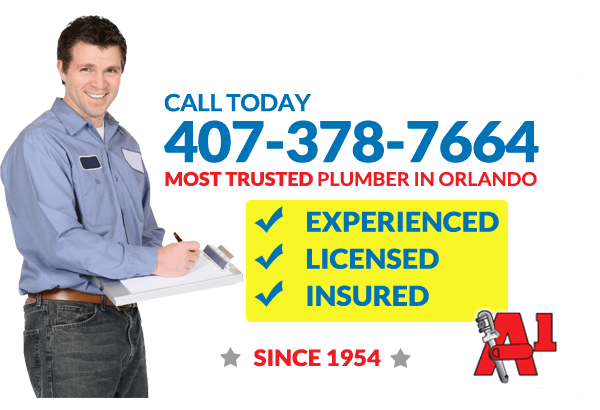 In case you are looking for reliable Plumbers Apopka FL, or you will like to hire the services of a company offering Emergency Plumbing in Apopka, and 24 Hour Apopka Plumbing, kindly get in touch with us at A-1 Plumbing Service. Our team of dedicated and competent plumbers are always ready to respond to your call and offer the solutions right away.